The Salter, — The Marblehead Salt Co. Origins of the Marblehead Salt Co.
An Athonite monk saying the Prayer of the Heart with a 100 knot prayer rope. Every moment was luminous. Quiet and stillness make it easier to enter into the heart. Sunset in the monastery's main church or katholikon. And during my time there, I learned about salt the way salt was meant to be, the salt that the monks had made centuries ago for the Roman Emperors in Rome and Constantinople. At the time I didn’t think much about building a business around salt. My mind was on other things while praying and working alongside the monks and monk-priests of one of the oldest Athonite monasteries whose Brotherhood stretches back to the 4th century. When I was ready to return to America, I had new focus managing a new incarnation of an ancient monastic expression of love and charity: St. Paul’s Foundation. Above all the monastic life is the way of quality — quality in prayer and worship certainly, but also quality in our relationships with others, our work and all our endeavors. Scrubbing the pots is no small task! 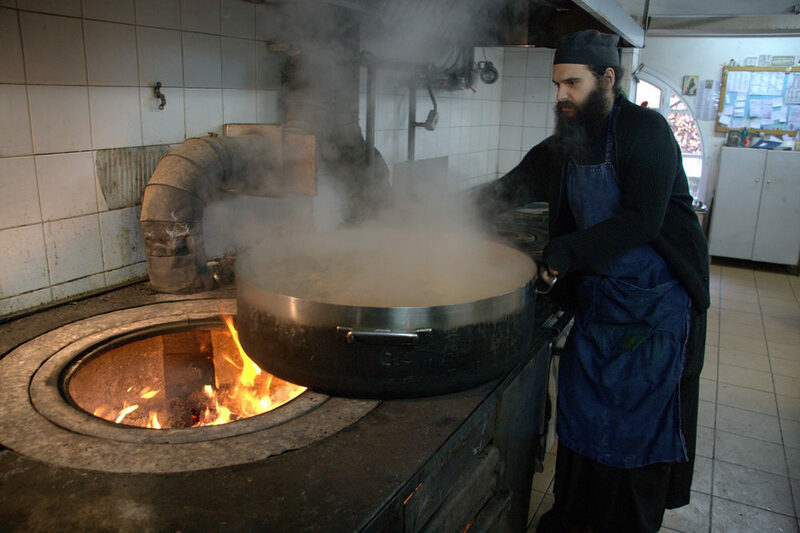 Every day the fathers not only feed themselves, but hundreds of pilgrims every day. Along the way I found another brotherhood, and a sisterhood also to be sure, of people who love and appreciate well prepared food and approach the meal with dedication and discipline which sometimes awes me. It has served as a way to meet a shockingly wonderful variety of people from all walks of life who understand that elemental grace arising from sharing a good meal with others. Not just chefs and foodies, but groundskeepers and laborers, stewardesses and sales associates, luthiers and lawyers, bankers and bricklayers, doctors and dentists, and many, many other people of goodwill. So in the beginning, every day I made salt, I would pull over 500 pounds of sea water by hand from over 14 different locations, salt blooms, off the coast of Marblehead where tide and temperature conspire in currents of perfectly blended waters showcasing the naturally occurring minerals and metals for which sea salt is known. Now there are others to help me, and gratefully, save my shoulders!. And as we pack the salt, we think of all of the wonderful people who will share a meal seasoned with Marblehead Salt — the laughter, the joy, the good and bad news. It’s like a little bit of our hearts go into the meal that you prepare. And of course buying our salt means that we can continue works of charity which have lasted over 1,600 years. And that makes our hearts swell with gratitude and joy that through salt we are part of your lives and you are part of ours. "60 Minutes" and Bob Simon step back in time when he gets rare access to monks in ancient monasteries on a remote Greek peninsula who have lived a Spartan life of prayer in a tradition virtually unchanged for a thousand years.